Physical characteristics: Both sexes are about 27.9 inches (71 centimeters) in height. Males weigh 8.2 to 14.1 pounds (3,720 to 6,410 grams) and females weigh 7.0 to 12.6 pounds (3,180 to 5,700 grams). Macaroni penguins have long yellow and orange feathers growing from the middle of their foreheads that look like eyebrows. The head and cheeks are black or dark gray, and the back is black. The breast, belly, and rump patch are white. Their eyes are dark red. 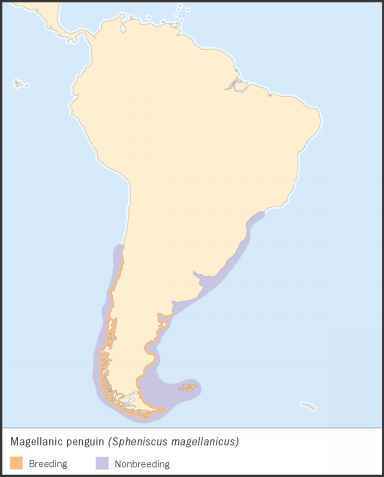 Geographic range: Macaroni penguins are found on Antarctica and neighboring islands. They remain in subantarctic waters during non-breeding season. Habitat: Macaroni penguins nest on steep terrain with little or no vegetation. Diet: They eat crustaceans, squid, and fish. Behavior and reproduction: Macaroni penguins breed in large colonies of up to more than one hundred thousand birds. They're noisy during breeding season, and it is by their individual calls that mates are able to recognize one another. 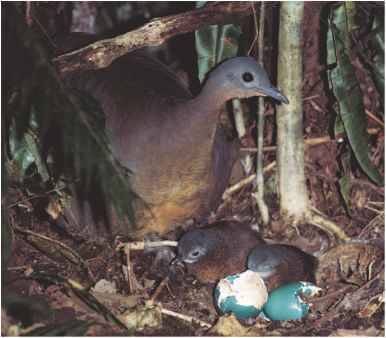 The female lays two eggs in her shallow nest, which is made by scraping in mud or gravel. The second egg, which is larger than the first, is usually the only one to survive. Parents take turns warming and protecting the egg. Within four to five weeks, the chick is born, and it survives on regurgitated food for the first month. In about ten weeks, they head out on their own. 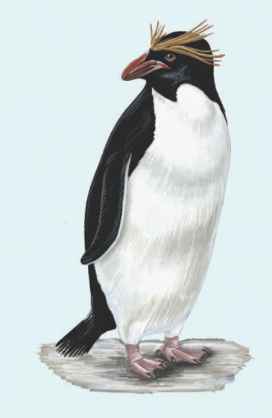 At sea, adult penguins must be on the lookout for Leopard seals, killer whales, and sea lions. On shore, eggs and chicks are eaten by petrels, skuas, and gulls.